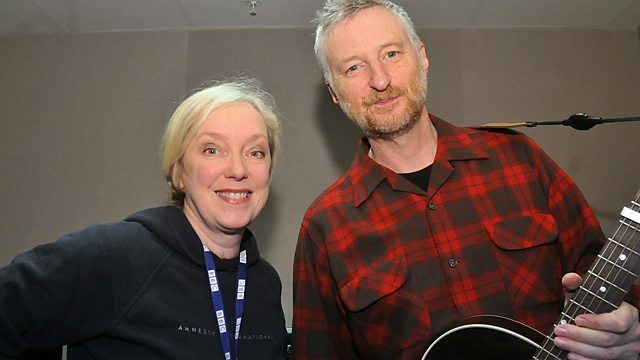 Singer-songwriter Billy Bragg joins Janice mid-tour for a chat and a couple of songs, plus Vic Galloway tells her about his new book, Songs in the Key of Fife. Singer songwriter Billy Bragg will be joining us mid tour for a chat and a couple of songs. Scottish Ballet's production of Hansel and Gretel is looking behind the scenes of the fairytale, taking influences from what the story means to people all over the country - from children to the elderly. We talk to the ballet's creator Christopher Hampson. Some of the world's best examples of Pop-Up Books are on display for Christmas at the National Library of Scotland - we look at their enduring appeal with curator Andrew Martin. Getting into screen industries is notoriously difficult -It's an industry that can seem to work on who you know rather than what you know, making it pretty inaccessible to most folk. Catriona McInnes has turned her considerable talents in all things celluloid to discovering and encouraging new, young talent through her enterprise JUMPCUT. Vic Galloway will be joining us to talk about his new book 'Songs in the Key of Fife' which charts his years as a member of the Fence Collective - the influential music scene involving artists like KT Tunstall and The Beta Band. He'll bring us up-to-date with the latest news surrounding the future of Fence. We're feeling very sleepy as we head into the Wee Small Hours - a Book Week Scotland event at the Louise Bourgeois exhibition at the Fruitmarket Gallery. Guests will be invited to stay up all night with a range of activities designed to draw you closer to Bourgeois' creative world. We get a taste for the event. All on the Culture Studio with Janice Forsyth.